Madam Secretary is definitely one series that you don’t want to miss and neither do I. So make sure to bookmark this spot and come back between 9:00 PM – 10:00 PM ET for our Madam Secretary recap. While you wait for the recap make sure to check out all our Madam Secretary spoilers, news, recaps & more! Tonight’s episode of Madam Secretary kicks off at the McCord house – the kids are all fighting over the TV. Alison wants to watch Project Runway, and her brother is playing video games. Stevie shuts them both down and puts on the news. President Dalton gave his State Of The Union address. Elizabeth and Henry return home and are excited to see their kids keeping up on current events. Russell Jackson stops by Elizabeth’s house – she has a meeting with the Dalai Lama tomorrow, it has been on her schedule for months. Russell wants her to postpone the trip, he begs her not to go through with it. Apparently, the Chinese hate the Dalai Lama, and they don’t want to upset them just a few days before they finish the treaty with China that they have been working on for months. Elizabeth is going to keep her meeting, but she promises to cut back on press and media coverage and keep it under the radar. Henry meets with an agent from the FBI, they finished Wayne Connell’s autopsy and have ruled that Ian killed him in self defense. But, they want Henry to pull Ian out of the cult. And, they are shipping the body to Wayne’s family. Obviously they are going to have to tell them how Wayne died, and Ian’s cover will be blown. Henry argues, there has to be some way they can delay sending home Wayne’s body. When Elizabeth arrives at the office the next day, it is full of local members of DC’s Buddhist chapter, the monks are all lined up waiting for the Dalai Lama to arrive. They have even set up a sand mandala for them to perform a ritual. While Elizabeth is dealing with the Dalai Lama, Jay’s soon to be ex-wife arrives at the office. She gives Jay a custody agreement – she wants full custody, and Jay can see Chloe one day a week and every other weekend. Jay is furious, he won’t accept the paper and says they can talk about it later. Elizabeth sits down with the Dalai alone, he reveals to her that he is dying from pancreatic cancer and doesn’t have long. Dalai Lama wants Elizabeth to endorse his predecessor, if he doesn’t put someone new in power that the US supports, then China will trample all over Tibet. Elizabeth tries to remind him that the US is neutral between China and Tibet, but he isn’t taking “no” for an answer. Later that night, Elizabeth and Henry are in bed, Jay calls Elizabeth and tells her to turn on the TV. Apparently, the Dalai Lama has named his predecessor, it’s a 2 year old Tibetan-American boy…and he lives in Delaware and is an American citizen. It looks like the Dalai-Lama found a way to have the Americans support his predecessor, whether they wanted to or not. Of course, Russell calls Elizabeth freaking out, moments later. The next morning, Elizabeth has Prime Minister Chen on the phone as soon as she arrives. He’s not happy that the new Dalai Lama is American. He warns Elizabeth that if they let the Dalai name an American predecessor, then they won’t sign the treaty. Meanwhile, they have more problems, a senator from Pennsylvania named Morton has been on all of the morning news shoes supporting the Dalai Lama predecessor, he even invited the Dalai to the upcoming Senate meeting as a guest. The Chinese are NOT going to like this. Jay meets up with a pal, who is a lawyer for lunch to discuss his options with custody. The lawyer thinks that Jay is going to have to play hardball, and he may have to use his ex’s postpartum depression against her. Back at the office, all hell is breaking loose. The treaty is falling apart right in front of Elizabeth, not only is China waivering, now India is backing out. Vice President Morton pays Elizabeth a visit, and she has some interesting things to say about Senator Morton. Apparently Morton just bought a huge share of a company, they make valves that are used in coal mining, and that’s why he is supporting the Dalai Lama and Tibet – and simultaneously screwing up America and China’s treaty. President Dalton and Vice President Teresa call a meeting with Senator Morton and let him know that the jig is up, they know all about his shares in the coal company and the real reason he is backing Tibet. They warn him that he could cost several countries a treaty that could save the world, over his own personal greed. Meanwhile, the Chinese are still upset about the Dalai Lama choosing his predecessor from America. Prime Minister Chen calls Elizabeth back and tells her that China will sign the treaty if America endorses the new Lama they have chosen – a 2 year old from China. Elizabeth snaps, she shouts at Ming that he is the one acting like a 2 year old. Nadine and Jay meet with the Ghuti Family, the parents of the American 2 year old that was chose as the next Lama. Jay is a mess because of his custody battle with his ex Abby. Nadine can tell that something is bothering Jay, she gives him some advice from her own personal experiences with her son. Henry is dealing with his own work woes, Ian still hasn’t found proof of the bomb. And, the militia is suspicious of him after Wayne disappeared. Henry and his partner decide to stage a car crash with Wayne’s body to convince his family that his death was accidental and to get the militia off from Ian’s back so he can get the intel that he needs. The Dalai Lama is admitted in to the hospital, he is rapidly running out of time. Elizabeth decides to pay him a visit. She tries to explain to him that if the treaty falls through, in a few years Tibet may not even have enough water supply to survive in a few years. She convinces the Dalai Lama to test the American child now and determine whether or not he is a true Lama. That way, they can move forward with the treaty. Testing the child before years of training would be breaking precedent, but the Dalai Lama is eager to ensure the future of Tibet before he passes. The next day the Dalai Lama passes away, a few hours later one of the Lama’s followers visits Elizabeth. He reveals that they tested the American boy, and he didn’t pass, he won’t be their new leader. It looks like China got themselves in a huff for nothing, the search for the Lama continues. And, now China and India can move forward with the treaty. 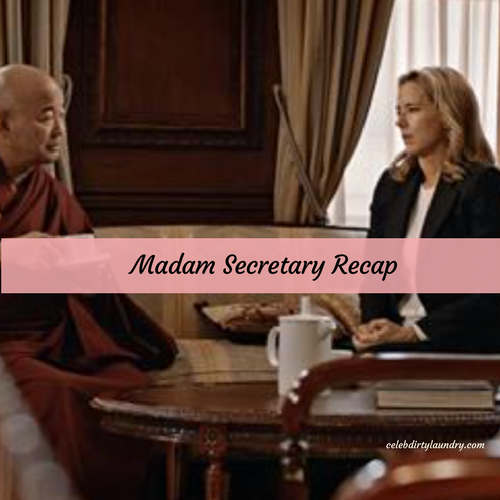 Tonight’s episode of Madam Secretary ends with Elizabeth participating in a Buddhist ritual with the monks before they head home.